Mills Community Hall, 426 4th Street, Mills, Wyoming. Patricia “Pat” Garner 78 of Casper died October 19, 2018. She was born March 27, 1940 to George and Pearl Jewell in Rawlins, Wyoming. She met Jack Garner and six weeks later they married on October 6th, 1959. They raised three children Christina (Chuck) Atack, Liz (Larry) Kellch and Jack Garner Jr. Pat was a very loving, giving and caring wife, mom, grandma and friend. She was an amazing Grandma who was always there for them. She never missed an event. She always loved taking care of people. She would help anyone in need. Pat had many pets over the years starting with a pet raccoon, Dewayne. She loved animals. She had variety of animals from horses to dogs. Most recently she had two dogs. She loved Annie and Buddy. 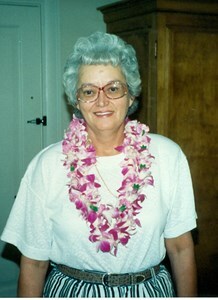 Pat and her husband Jack had many ventures throughout their years. They sold bicycles, snowmobiles and even Harley Davidson motorcycles. She worked a variety of different jobs throughout her life. Her favorites were working for I-Reach and Nowcap Services. That was where she found a true passion working with individuals with special needs. For many years Pat loved drawing and painting. She spent countless hours and late nights helping Liz with one of her many painting or craft projects. When she retired from working she spent even more time focusing on her grandkids and great grandchildren. Her grandson Jeremy has three children who Pat adored. Jarrett, Aspen, and Juddson whom always brought a smile to her face whenever they were around. Her grandson Derek and wife Kristy have two girls, Kaytlynn and Dahlila. They too warm her heart. She enjoyed having as much family around as she could. When she still could drive (although her abilities could have always been debated) she would pick up her grandkids or great grandkids and hang out with them as much as she could. She enjoyed the little things whether it was taking Kaytlynn to church with her, Jarrett talking to her about hunting, Aspen’s newest project for 4H, Judd’s aspirations of being a youtuber, or Dahlila wanting to go play in the dollhouse (which Jack made specially for Pat), Pat always loved being with family. Pat was a very strong woman. She developed Breast cancer in the 1990’s and survived. She was also a diabetic among many other ailments. She fought to the very end and will be missed by many people who loved her and surrounded her. She was preceded in death by her parents, and her sister, Mary Louise Henry. In lieu of flowers any donations made can be sent to Central Wyoming Hospice. A Celebration of Life Luncheon will be held at 12:00 pm, Saturday, October 27, 2018 at Mills Community Hall, 426 4th Street, Mills, Wyoming. Add your memories to the guest book of Patricia Garner. To:Jack and family.Sorry for your loss of Pat.We are thinking of you at this time of sadness.The Clamps. Lady. Our thoughts and prayers are with you. Richard and Betty Tweeter. JACK WE ARE SO SORRY TO HEAR ABOUT YOUR LOSS. PAT WAS ONE OF A KIND AND WILL BE GREATLY MISSED BY ALL THAT KNEW HER. TAKE HEART IN THE FACT SHE IS NO LONGER SUFFERING. I KNOW THAT IS SMALL COMFORT BUT IT WILL GET BETTER. Patty Jewell as we all called her was a true friend (more like a sister) She will be greatly missed! I am so sorry for "your" loss but so happy for those in heaven who have been waiting for her. Loved her so much. We are thinking of you today and are so sorry for your loss. We hope the memories of happier times help you celebrate Pat's wonderful life.